Event Description: A fascinating, up-tempo place to participate in a corporate teambuilding event, Tel-Aviv (in Hebrew “Hill of Spring”) –stretched along a beautiful stretch of the Mediterranean — is Israel’s largest city and its biggest commercial center. 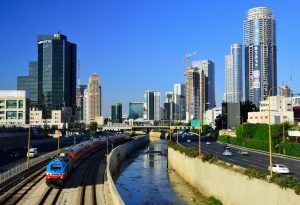 If Jerusalem is celebrated for its religious holiness, Tel-Aviv is notable more for its secular pleasures: entertainment venues, shopping malls, exotic markets, nonstop active nightlife, gorgeous golden beaches and wonderful restaurants. Your Dr. Clue treasure hunt in Tel-Aviv revolves around the lively Shenkin Street area, with its Bauhaus buildings and tree-shaded boulevards, and stretches all the way to the seaside. During your corporate teambuilding treasure hunt…Expect to see a mural of giant fruit; a glittering mosaic of Tel-Aviv history; a stained glass window from the Great Synagogue; a statue of a broken bridge; and a wall-painting of famous intellectuals. The name is apt; these “hills” certainly are “springing” with hidden treasure.